…and the paint (I think) used on the surface didn’t quite melt, while the wax underneath it did. I guess you could say it had good skin… hahaha. Just another mindless lechon oriented diversion. Can you tell I am busy at work? 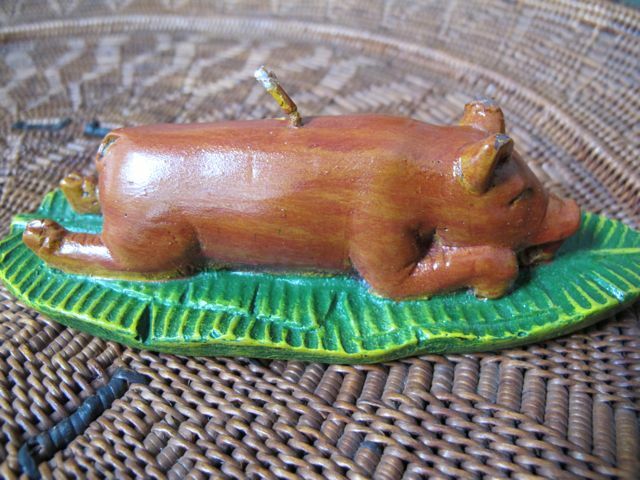 MM, you should have been playing the fiddle while watching the lechon candle burn. What’s next – watching paint dry? Enjoy your “time off”. The question is… Was it lechon scented as well? ???? speaking of lechon, is there gonna be a Zubuchon branch opening in Manila anytime soon? Was this especially made for you MM? If not, Fillet mignon must have searched high and low to find you the most appropriate gift and that was so nice of him. Like Ana5678, it would have been really interesting if it were lechon scented as well. 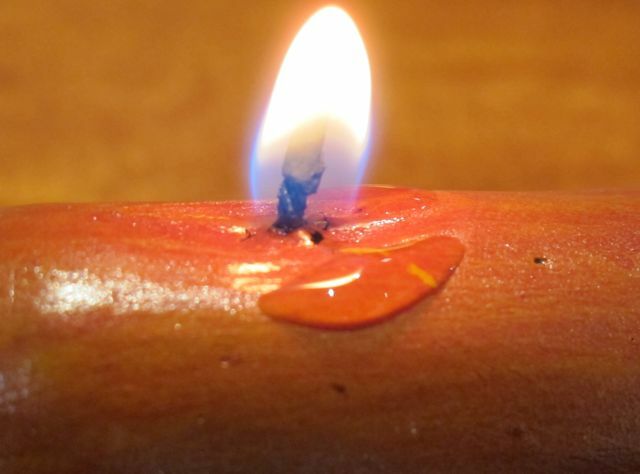 and the wick looks just like a knife stuck into the balat! hahaha! busy at work … i’m busy as well … busy waiting for inspiration to strike. maybe i should head for the market … this usually works, just seeing the wonderful produce does the trick! 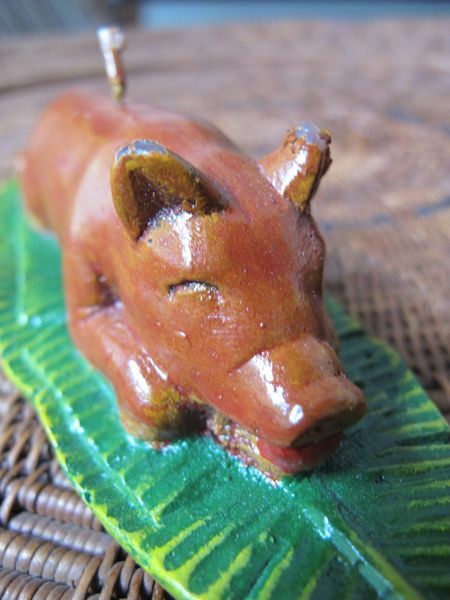 The perfect gift for a lechon icon. On another topic, MM, I tried your pandesal recipe. They turned out good texture wise. More dense than the regular pandesal that we buy here. Reminds me of the pandesal from home. I must have put too much salt because it is a bit salty. Next time I will reduce the salt. I ate the pandesal with corned beef. Husband had butter with it. Also, I found Pancit Lucban at Seafood City. I got a pack and will try it tomorrow. That’s from gkonomics, a partner of Gawad Kalinga. Nice. Hi MM – cute, the pig candle I mean. That was an interesting review of the the ‘stock investment’ a few blogs ago. Many thanks for that. Why am I not surprised about the reports of unfulfilled expectations about the Goldilocks book? A few years ago, I got hold of a copy of Baker’s Formulary compiled and “tested” by the U.S. Wheat Associates, Inc. (Philippines). None of the five recipes I tested turned out to be correct. One bad recipe in a cookbook is one too many for me. I even bristle at chef’s restaurant’s recipes not being tested in domestic settings. There ought to be a law against publishing misleading, intentionally erroneous and untested recipes to protect cookbook consumers and amateur cooks alike and lessen their likelihood of being bilked by unscrupulous authors and publishers. 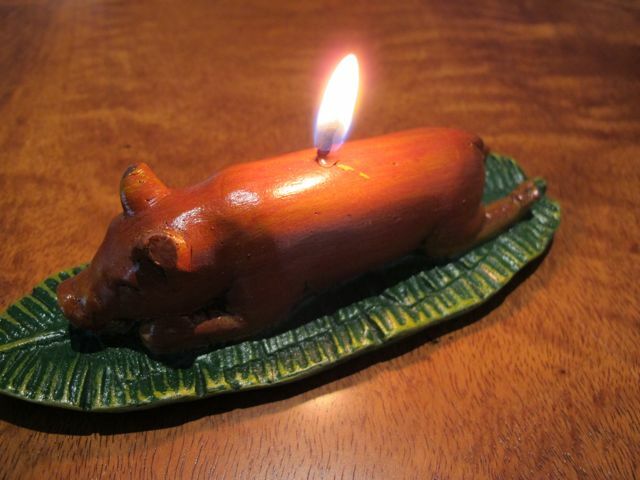 I think you should sell the lechon candles if you can get them produced. I so wanted to buy ‘Linamnam’ before I left Manila mid- september but couldn’t find it in all the bookshops where I looked. I loved Claude ‘s ‘Food Tour’. Back in July. Still minus 10 tomorrow…but there are good challenges for cooking in freezing climates here, I”ve just learnt to produce a quite yummy ( according to my teen, hungry and cold, doing the last tough stages of his French Baccalaureat, which includes running in the snow…in between math and physics and chemistry and philosophy) Boeuf Carbonnade – ok, whatever the temperature, it’s still good guys, do all your braised beef recipes in dark beer. Make it scented with lemongrass oil. The Goldilocks recipes were supposed to have been tested by Heny Sison under ‘residential’ conditions, i.e., a home baker should be able to easily replicate said recipes. It should be a ‘good’ (an OK) cookbook for a young child wanting to venture into baking. Having said that, with the advent of the internet and the wealth of books/instructions available (hard and soft copies), there would really be no point collating such books and putting one’s brand on it. I suppose what I am really looking for is a point of differentiation – considering that Goldilocks is a big (in the Philippines, anyway) brand, the book does not do anything to enhance or elevate the brand. MM, I am only currently in Region 1. I, like a lot of people, have tons of cookbooks. I enjoy reading them and doing the recipes in them. It’s a mix: I have famous chefs/cooks/authors, as well as generic ones. DK published cookbooks are quite instructive in the sense that it will give you a basic, somewhat authentic taste – a can’t go wrong cook book. I’ve had books by famous chefs whose recipes you could never replicate. And like Footloose, I have books by supposed authorities who have mutilated the recipe (these books are far and few between, thank goodness). I am fortunate that by looking over several recipes, I can pretty much tell if it’s a good instructional or not. My next challenge is to make cakes using cake flour – not at all popular/familiar in Australia. Difficult to find and expensive. This journey has been quite educational too! The lechon candle sure looks yummy! Hahaha! MM, I am so excited to be in Cebu next week. Zubuchon, here I come! Filet Minion, I am sorry I forgot to inform you that the potted olive tree cultivars (is that how you call them?) were confiscated at the Dubai airport. I wanted to give them to you so the GK farmers can try to cultivate them. I couldn’t put them inside my checked luggage because the bags were already bulging and I was concerned that they would wilt. I did check with Emirates before departing and they told me it was okay to hand carry fruits, tree barks, seeds, etc. Apparently, it is not… I will try again next time I go home (will check them in). This caught my eyes when I visited the Gawad Kalinga’s GKonomics showroom in Taguig recently. I think it’s cute. From this website, it can be gleaned that there are other scented food candles made by GK Freedomville in Laguna like puto bumbong and local fruits. Another shameless plug—Human Heart Nature is also opening an extended flagship store and cafe in a few weeks along the highway hell that is Commonwealth Ave [though the store itself looks like it deserves to be in Serendra]. A kiosk will be dedicated to GK Enchanted Farm and other GK social entreprise items will be showcased there. The lechon candles and others should be there too. MP! You’re too kind to actually attempt! I’m so sorry to hear the seedlings got quarantined! Sayang!!! Speaking of lechon, when are you going to have a Zubuchon branch in Manila?